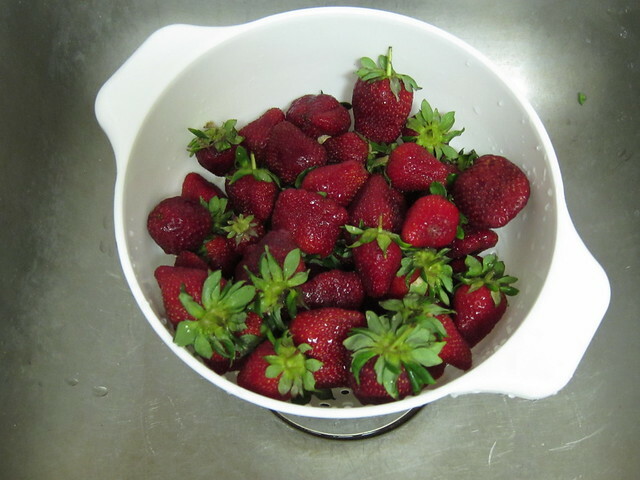 John and I picked 14 pounds on strawberries on my birthday. I turned them into 7 half pints and 6 pints of jam. This is the recipe that I use. It's full of a lot of helpful hints that I'm not including here. The Pick Your Own site is also a great resource for farms in your area, canning how-to's and a TON of great recipes. This is my first time canning on the new stove. 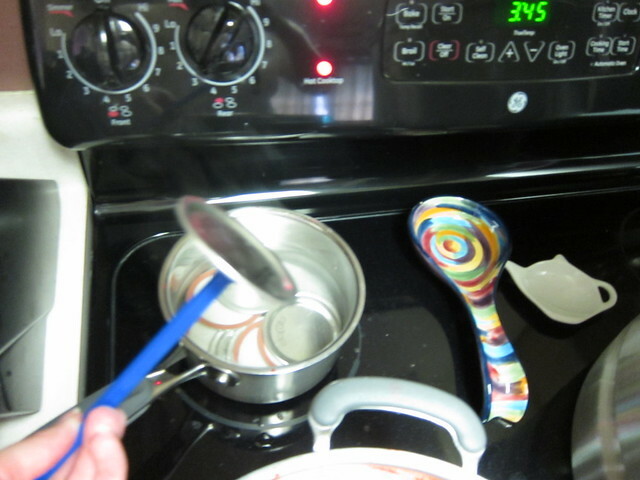 I did a lot of research when I bought the stove to make sure I could can on a flat top. What you really need is at least a 12 inch burner. You can find a canner that's this size, but it's hard, more expensive and you can't can as much as once. So I found a stove that allows you to go 2 inches larger than the burner. Sometimes this can damage the stove or the element won't work properly so make sure that your stove allows for this. You also need to have a flat bottom canner. Again, this is more costly, but I improvised. The graniteware canner that's common is light weight, but ridged on the bottom so it won't heat properly. If you don't get the right amount of heat your jars won't process. 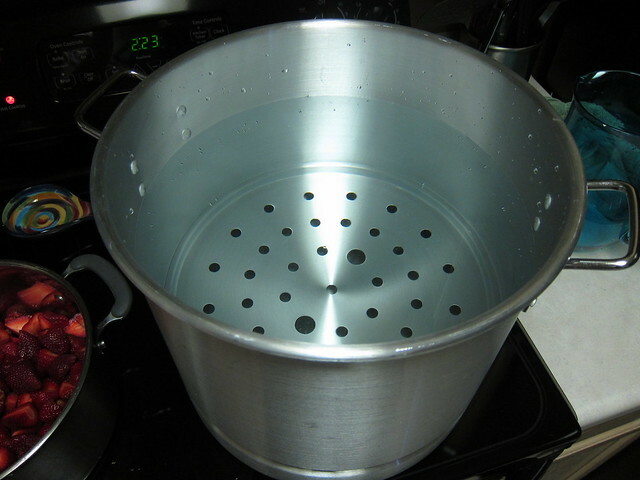 I went out and bought a 32 quart tamale steamer for less than $20. 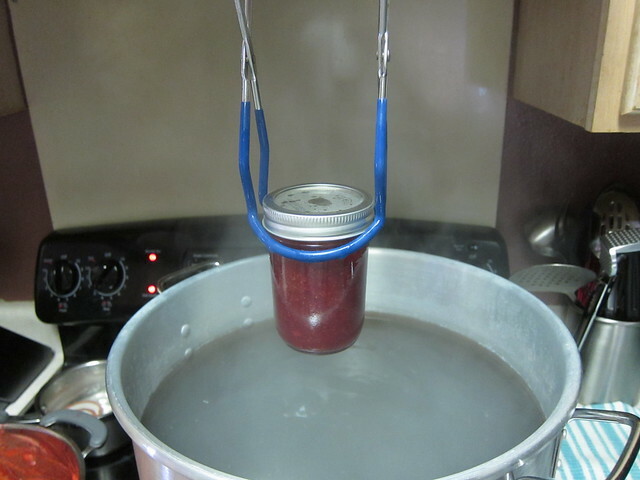 The rack on the bottom allows you to set your jars on there in place of the traditional basket in other canners. 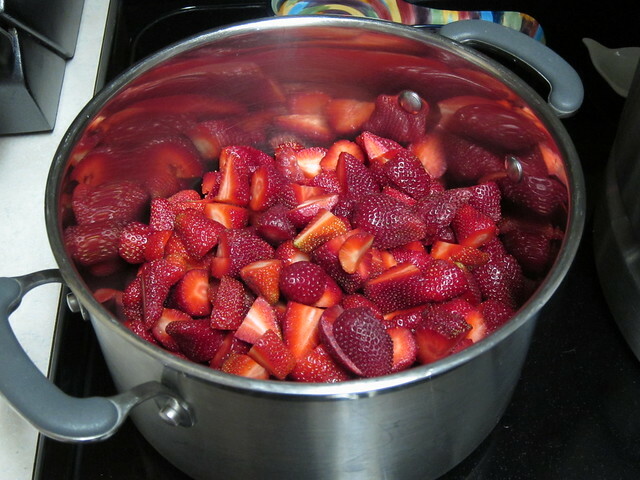 To make a batch of jam you'll need about 5 pounds of strawberries or about 10 cups whole berries. Be sure to wash and then hull them. I'm lazy and just chop the tops off of them. If you'd like you can use a potato masher to mash up your strawberries, but I just take my immersion blender to it and leave some nice chunks in it - the chunks are up to you. You need to have 5 cups smashed strawberries for your jam. 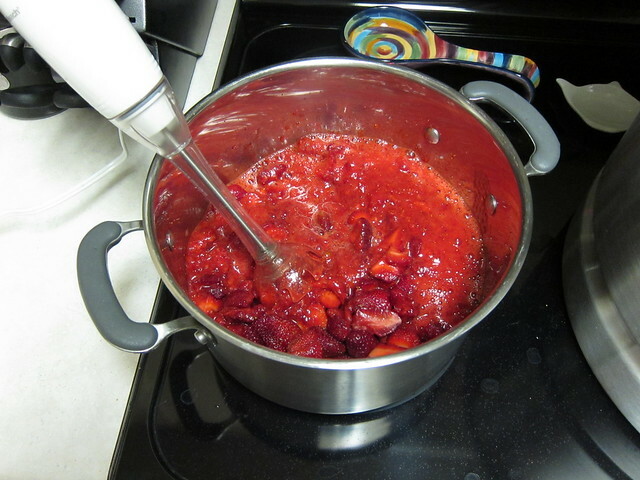 Once your strawberries are nice and mashed it's time to add sugar and pectin. 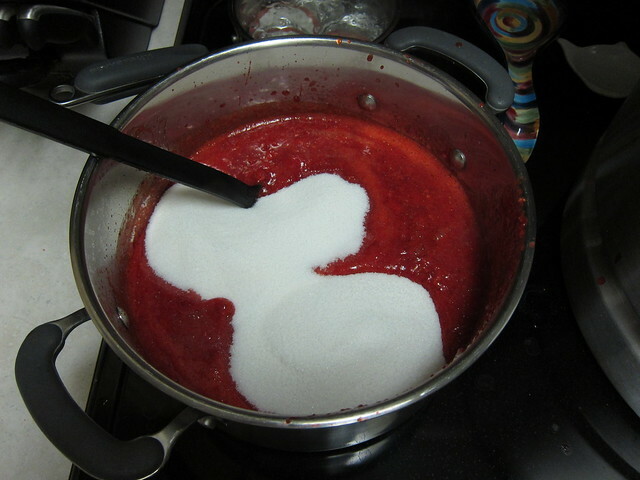 Lots of sugar, but that's what makes jam taste so good. Now I actually use the no sugar pectin with 4 cups of sugar as opposed to the regular pectin with 7 cups of sugar. I've made jam both ways and cannot tell the difference. If you can make it with less sugar then go for it. I have had some trouble finding the no sugar pectin at times though. Of course you can use the no sugar version, with no sugar, but I have not actually done that. 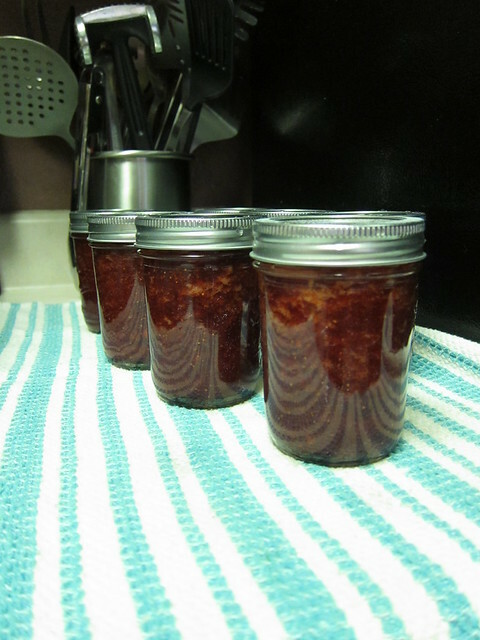 The recipe I use says it can make the jam runny and dark. 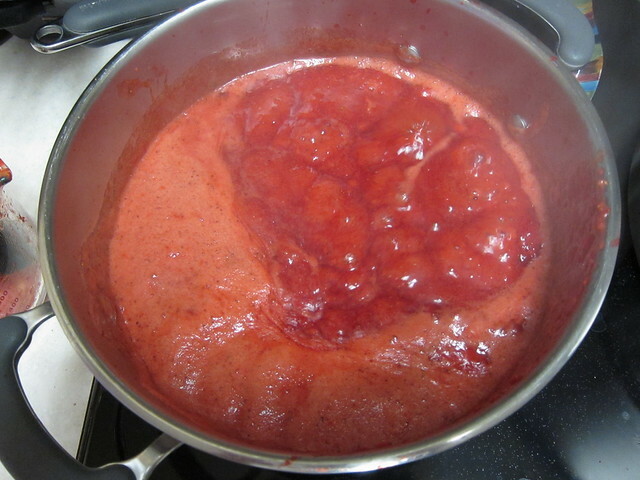 Mix your sugar and pectin well and bring to a boil for good minute. Then you'll need to skim off any foam off the top. I usually have a lot of foam so good luck. Foam won't kill you, it just doesn't taste as good. 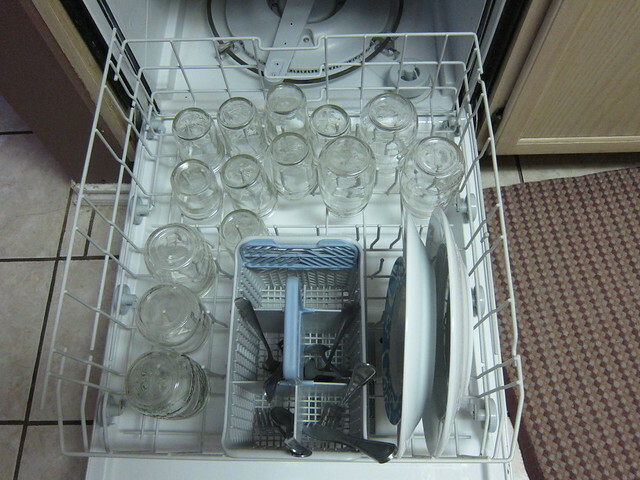 Then take your sanitized jars out. Some people put theirs in the canner, but because we have hard water that leaves deposits in and on everything I sanitize mine in my dishwasher. You just have to time it right so they get washed and sanitized and then are nice and warm when it comes to pull them out. You don't want to put hot liquid into cold jars. Then put your jam into the jars. Be sure to wipe the lip of the jars so that you get a good seal. It's a crap picture, but take your lids that you've been sanitizing in boiling water and place them and the rings on the jars making sure that you get a good seal. Then put your jars into the canner. 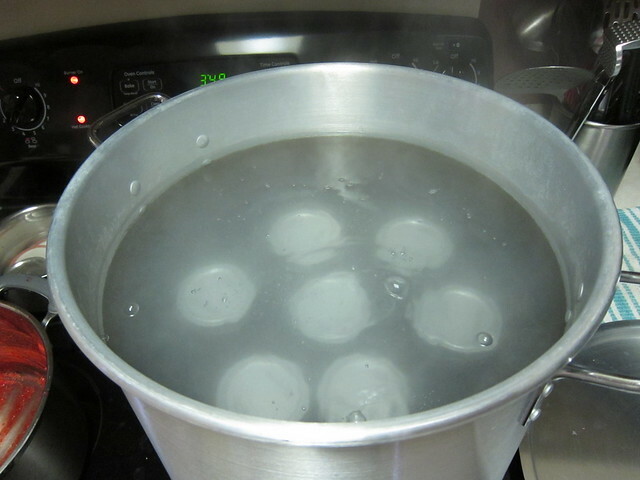 Jam processes here in boiling water in just 5 minutes. So when they're done pull them out to cool. You'll hear little popping sounds while the jars seal themselves and you can always press down on the lid to make sure it doesn't pop up. Some take a little longer than others. If you have one that doesn't seal you can just stick it in the fridge to use right away. 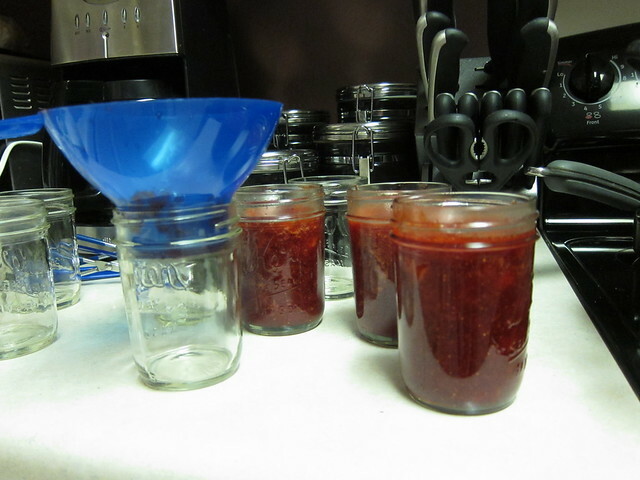 So that's how you do strawberry jam! I actually did two batches to get all of mine. 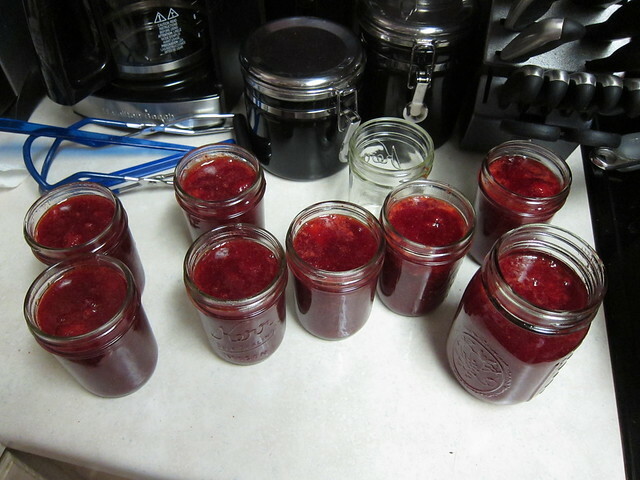 You don't want to make more than one batch at a time because there's a good chance the jam won't set.